Register here to join the conference this October! Please briefly describe your interest in the conference and why you would benefit from attending. You are welcome to attend the conference for free. However if you can afford it, we would welcome your help covering some of the costs of putting together this event. We suggest an optional registration fee of $15 (or any amount of your choosing). We would really appreciate it! UAEM is a registered 501(c)(3) organization in the USA. Tax receipts will be issued for your donation. Secure online payment can be done via the UAEM Donation page. You may receive updates from UAEM, the sponsor of this form. Register for UAEM North America 2018 Annual Conference! 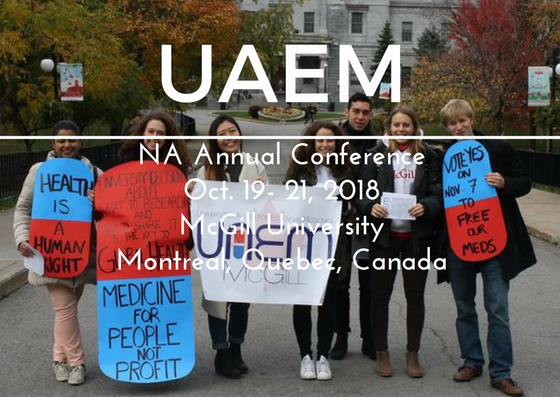 The 2018 UAEM North America Annual Conference will take place at McGill University in Montreal, Canada from Friday, October 19 to Sunday, October 21, 2018. UAEM's annual North American conference is an opportunity to inspire, educate, skills-build and mobilize students from a variety of disciplines to become part of something bigger and act now on the access to medicines crisis at their universities. If you would like to join the conference, please complete the registration form. The conference is FREE to join but donations are welcome. Saturday, October 20, 9:00 a.m. - 5:00 p.m.
Sunday, October 21, 9:00 a.m. - 4:00 p.m. Note: To maximize your experience, we recommend that you plan to arrive on Friday afternoon/evening and depart on Sunday evening. There is no formal dress code but UAEM or activist T-shirts encouraged. You can apply for travel funding and housing once you complete the registration form. This Conference is made possible through the generous support of the Open Society Institute, the Perls Foundation, Doris Duke Charitable Foundation, Opportunity Fund, McGill Global Health Programs and donations from UAEM Students, alumni, and supporters. We are pleased to announce that Air Canada is offering a 10% group discount for those attending the UAEM Annual Conference in Montreal. Reservations and booking are available via aircanada.com . When you book your flight, please access aircanada.com and enter 4BHCEK61 in the “Promotion Code” box to get the discounted rate. Discount is valued for travel period that begins October 11, 2018 and ends November 01, 2018 . Please click here to read further applicable rules.